Every time I read through the book of Daniel, I feel so wimpy. What an amazing Christian this man was! Captured from his homeland to serve in a foreign country, he did not grow bitter or angry! He stood strong first in his beliefs to follow God’s laws regarding food, and later in his resolve to walk with God even when it displeased others. I wanted to jot down a few notes from my reading today, more for myself than for you. This blog is a handy-dandy notebook for me, since I know I will never lose it! lol! Verse 4 – The princes look for a way to get rid of Daniel. Verse 5 – The only “fault” they can find is that he worships God by praying three times a day facing Jerusalem with the windows open. Verse five says “We shall not find any occasion against this Daniel, except we find it against him concerning the law of his God.” Wow. Verses 6-9 – They convince Darius to sign a law stating that no petition can be made of any one except the king for the next 30 days. If Daniel had stopped praying for merely a month, he would have been spared any punishment. If he had closed his windows, his prayer time wouldn’t have been so obvious. But he didn’t. Verse 10 – Daniel does right. This verse says “he went into house; and his windows being open in his chamber toward Jerusalem, he kneeled upon his knees three times a day, and prayed, and gave thanks before his God, as he did aforetime.” Daniel did not change. Not only that, but he gave thanks to God. How many things I take for granted and fail to thank God for! How many times I have failed to be a faithful testimony and witness! 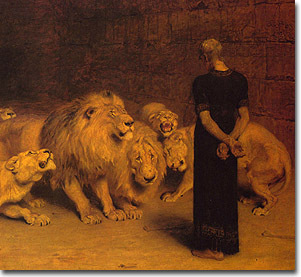 Verses 11-15 – The king is told of Daniel’s breaking the law, and King Darius is heartbroken. He loves Daniel, but after laboring all day, he cannot seem to find a loophole to save him from the den of lions. I want to be faithful even when it’s hard to do. I want to pray more. I want to thank God more. I want to trust Him more. I don’t believe I will ever achieve the Christian character and strength that Daniel had, but I want to try. After all, I serve the same living God that he did! I’m a wimp, but I don’t want to stay that way. Lord, please help me to be faithful. It’s easy to do right when others are standing with me or when things are going smoothly. Help me to stand strong, like Daniel, even when adversity comes my way and I’m all alone. Help me to fall at Your feet when I fail, and get back up and start again.The devil wants to get me discouraged so I’ll quit, but don’t let me give in. Thank you for your forgiveness and mercy. I love you, Lord!